A dozen years after it was last updated Health Canada officials released the newest version of Canada’s Food Guide earlier this month. Just south of Tofino, in the traditional lands of Tla-o-qui-aht, Joe Martin can be found carving a new cedar canoe. One of the largest lakes in Nuu-chah-nulth territory now has improved wireless service with the recent installation of a cellular tower. Award-winning journalist Wawmeesh Hamilton will be returning to his hometown later this week to read and discuss one of his favourite articles. The early winter storms of December and January hit Vancouver Island with a vengeance - but islanders showed their resilience as they pulled together to help one another. Humans are to blame and things are not about to get better in the foreseeable future. Today members of the RCMP came to the Teechuktl Mental Health office to sign an agreement that for years Geraldine Edgar-Tom didn’t think was possible. The December storms of 2018 have gone down in history as the most damaging ever, according to BC Hydro. Continuing research involving enhanced training through a Nuu-chah-nulth community-driven nursing approach is expected to lead to better health care in remote First Nation communities. Nuu-chah-nulth youth will be heading to New Zealand to experience the culture of the country’s Indigenous Polynesian people—the Maori. A tree stump sits next to a logging road in a harvested section of the Nahmint Valley, surrounded by piles of fallen old-growth stands awaiting transportation to lucrative timber markets. Parks Canada officials have been installing signs around the Pacific Rim National Park Reserve recently to educate the public how to better co-exist with wolves and other wildlife. Health report provides encouraging and disappointing news for Indigenous people in B.C. A report released earlier this month tracking Indigenous health in the province during a 10-year period offers both positive and disappointing results. The federal government is pledging to change the way fish farms are run in Canada - while creating more jobs and protecting the environment in the process – through the development of an aquaculture act. The storm warning issued by Environment Canada has delivered on its predicted damaging effects on much of Vancouver Island. Yet another major windstorm is set to barrel down on the west coast of Vancouver Island. Environment Canada has issued a public alert warning to coastal residents of strong winds that may cause damage. 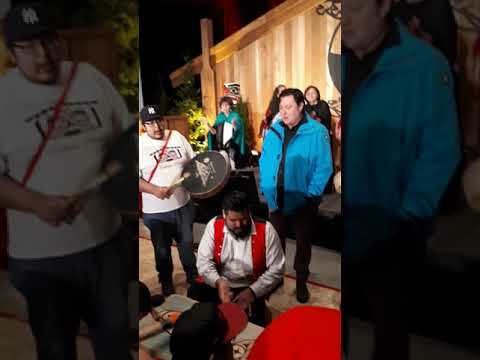 This year's Urban Gatherings for Nuu-chah-nulth-aht who live in centres away from their traditional territories concluded with an event in Victoria on Dec. 14.